Is it really possible to have this much freedom to move while sitting? Take a seat on the E3 Crescent Saddle Stool by UPLIFT Desk and your body will give you the answer. A proper ergonomic setup is one that promotes healthy movement and encourages your body to switch between sitting and standing postures frequently as you work. By getting out of your chair and perching on a side seat, such as a stool, you boost circulation and prevent the development of sitting injuries. Incorporating a height adjustable stool into your routine takes pressure off your legs and feet, and assists you in working with more energy. UPLIFT Desk's E3 Crescent Saddle Stool is the ergonomic seating solution to get you perching, tilting, and swaying side to side, engaging your body in more stimulating motion at your sit-stand desk. The choice is up to you! Enjoy the E3 Crescent Saddle Stool's comfortable plush seat, which rotates to allow users to sit on it in either traditional (perching or straight ahead) or straddled positions. This flexible stool is a great complementary seating option if you find yourself routinely shackled to your office chair or computer for several hours. Ergonomists advise rotating between perching on the stool and sitting in an ergonomic office chair with full lumbar support; this allows you to strike the perfect balance between energizing movement and effective back support. When you feel restless, uncomfortable, or fatigued at work, simply switch your posture on the E3. Office seating doesn't have to be boring. Mix up the colors in your workspace with a turquoise, orange, or green upholstered seat on the E3. It's fun to match with your current color scheme - or to add a completely different shade to your office's decor. The E3 Crescent Saddle Stool's wide, molded dome base sits flat on the floor, giving you steadfast stability to perch, tilt, rock, and sway. In addition to its reliable base, the stool boasts a revolutionary pivot cap design that allows it to bend from a point under the seat, tilting just the seat and not the whole stool, which helps to keep the stool upright even when you're seated at full tilt. Go for a spin on the E3's comfy, padded foam seat cushion. That's right, this seat rotates a full 360 degrees, so you don’t have to twist awkwardly to talk to that colleague behind you. This motion-assisting stool pivots at the seat, which allows you to move from the hips (instead of from the ground like a lot of active stools). So crank up that song you've been jamming out to and get into the rhythm! You'll enjoy a surprisingly large array of side-to-side motions on this satisfying swivel seat. Finding the right perching height is crucial; that’s why the E3 comes standard with a taller gas cylinder. With a full 23.8" - 29.7" height range, this stool comfortably fits more users than many comparable stools (some can only raise as high as 26"). The pneumatic stool raises and lowers to your preferred levels with the squeeze of a handle, so you can adjust it to fit your posture in a matter of seconds and get back to the task at hand. Thanks to its lightweight design, the E3 Crescent Saddle Stool is easy for users to pick up and move, making it your portable side seat to take around the office or the house. Grab the stool by the seat and bring it to brainstorming sessions, lunch areas, quiet rooms, and all of the places where you want to perch and sit with more engaging seating. Needless to say, it's made to move with you in more ways than one. Seat dimensions 15.75" x 10.5"
Recommended user heights 5'1" to 6'3"
What makes the E3 Crescent Saddle Stool so ergonomic? The E3 is ergonomic because it allows you to supplement your office seating with a stool that supports your body and also lets you move more. Thanks to its comfortable seat, which adjusts to meet you at that perfect perching position, you can rest your legs and feet while engaging in more energizing motion while you work. Can I use this stool at my height adjustable desk? Absolutely! The E3 was designed to be used at sit-stand desks and fixed-height desks, and is height adjustable from 23.8" (at its lowest point) to 29.7" (at its highest point). Yes, weighing in at less than 12 pounds, this stool is lightweight enough for most users to pick up and move to new locations around the office. Is the E3 suitable for children? Possibly, and this depends on their height. The E3 does fit some middle school and high school aged kids with heights ranging from 5'1" to 6'3". However, we do have other kid-friendly stools that do the job for little users! 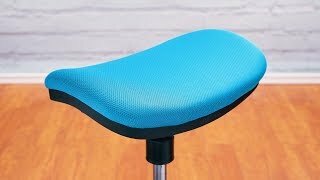 How is this different from the Motion Stool or E7 Stool by UPLIFT Desk? This unique stool is different from previous ergonomic stool designs thanks to its elongated, crescent-style seat that allows you to sit in two positions. Also, the E3 tilts from a point underneath the seat and not from the base like UPLIFT Desk's E7 Stool and Motion Stool, which lets users engage the seat in a whole new set of hip-swaying ways. I'm 5'3", will this work for me? Yes, this stool was designed to be suitable for users ranging from 5'1" to 6'3", making it perfect for a majority of users. How supportive is this stool? Can I use it all day? The cushion on the the E3 Crescent Saddle Stool is comfortable and supportive. However, the stool lacks a backrest, armrests, and lumbar support, so a stool is not a substitute for an all-day ergonomic office chair. The E3 is meant to complement your office chair, but we do not recommend replacing it! Can I use this on soft floors like carpet? What about hard floors like hardwood? This stool is designed to use on hard and soft floors, so that means hardwood, concrete, tile, and carpet are all acceptable surfaces for the E3. Choose from turquoise, green, or orange upholstered seats on your E3 Crescent Saddle Stool. $89.00 List Price: $119.00* The list price is the same as the MSRP (Manufacturer's Suggested Retail Price). It may not necessarily be the price at which the product is sold.